Cui Nan/CHINA NEWS SERVICE/VCG via Getty ImagesH-6K bombers fly in the formation during a military parade at Zhurihe military training base to mark the 90th birthday of Chinese People’s Liberation Army (PLA) on July 30, 2017. Chinese bombers are increasingly active and flying farther from China’s shores, according to a Department of Defence report released Thursday. 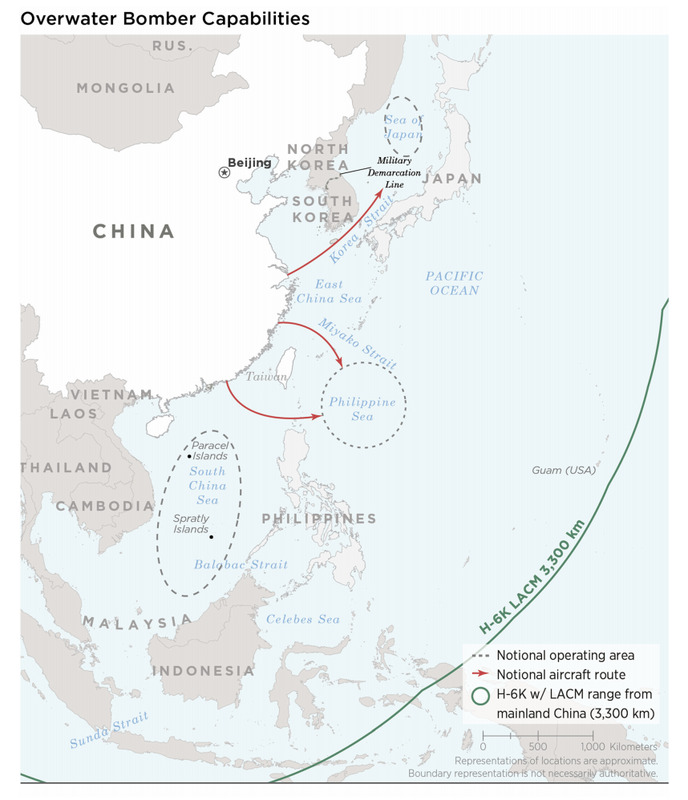 Last year, PLA bombers flew a dozen operational flights through the Sea of Japan, into the Western Pacific, around Taiwan, and over the East and South China Sea – all potential flashpoints. There were only four flights respectively in 2015 and 2016, and only two between 2013 and 2014. The Pentagon report noted that in August 2017, the Chinese People’s Liberation Army Air Force (PLAAF) expanded its operating area by sending six H-6K bombers up past Okinawa for the first time. The bombers flew along the east coast of the island, home to approximately 50,000 American military personnel. Activities around Taiwan and in the East and South China Sea are also alarming given Beijing’s contested interests in these areas. China is in the process of modernising its military in an attempt to fulfil Chinese President Xi Jinping’s vision of a world-class military that can fight and win wars in any theatre of combat by the middle of this century. Part of this process is the development of power projection tools, such as aircraft carriers and long-range strategic bombers capable of striking targets with both conventional and nuclear payloads. The US is watching these developments closely, as the Pentagon believes that “great power competition, not terrorism, is now the primary focus of US national security,” as Secretary of Defence Jim Mattis explained earlier this year.